Even before Max arrived home from Disney World on Monday, he was campaigning for the next trip. "June!" he informed Dave, hopefully. "I love Florida!" he said when he called. 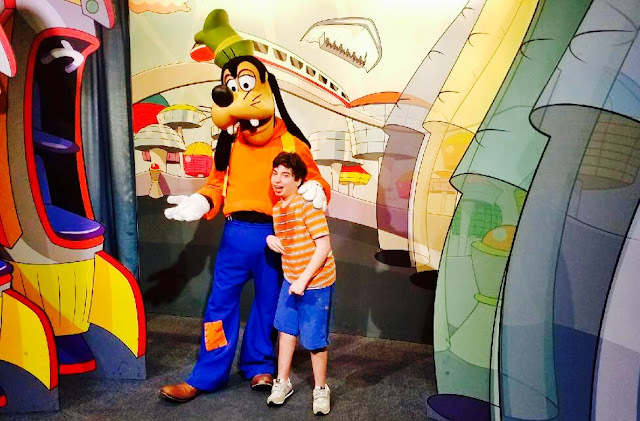 I've been explaining ever since that if you don't live in Florida, going to Disney World isn't something you get to do very often, and that it's good he had such an amazing time when he was there. He hasn't let up about going back. "Florida new home!" he announced this morning. "Florida is your new home?!" I asked. "Hmmm.... It would take you a very long time to get back and forth to school, because you'd have to travel on a plane every day," I pointed out. That gave him pause, because he loves his school. "Ben Disney World!" he said. "You want to take Ben to Disney World?" I asked. This evening, Max came up with a new tactic. While I was in the kitchen getting a snack, he trotted over with his iPad to show me a photo of SeaWorld. As in, he wasn't asking for Disney World again, so from that point-of-view, his request deserved to be considered. I noted that we have some cool aquariums near us, along with places where he could go on rides, but: no. "Eeeworl!" said he. Part of me loves that Max is pushing so hard, because he is learning to advocate for himself. I've long done that for him, but one of my greatest hopes is that Max will learn to stand up for himself. The other part of me is thinking, "Oh, boy, we are in for it." This is so great! And yes, I agree about the dual thought process, where on the one hand you're glad he can negotiate with you, and on the other hand you're just like "now what are we in for?" We started getting that here when my son figured out how to request a later bedtime. We'd remind him that he had to get ready for bed in 5 minutes, and he'd look up and say "15 minutes? 20 minutes? ", at which point you don't know whether to laugh, scream (quietly to yourself, of course), or just tell him "no". LOL, I think we were surprised enough by this new development that we actually let him play for a few more minutes. You KNOW I can relate! Update: Today, Max informed his bus driver that he is going to SeaWorld. His vocabulary word was "proceed" and this is how he used it in a sentence: "I will proceed to Sea World when there is no school."